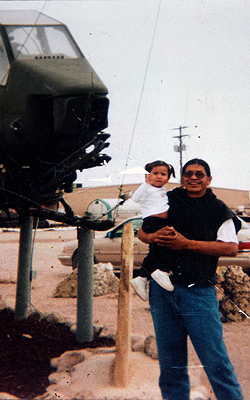 Ben is a 68-year-old US Marine veteran of the Oglala Sioux Tribe. 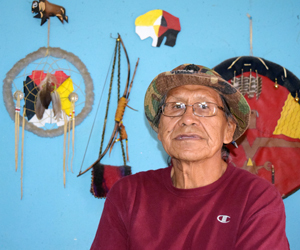 Ben is a resident and citizen of the Oglala Sioux Tribe in southwestern South Dakota. At 68 years of age, he was an Elder and a father. He raised his two girls, Vicky and Ruby, who were in middle school, since the eldest was 3 and the youngest an infant. About 12 years ago, they moved to the small tribal community of Red Shirt on the Pine Ridge Reservation. 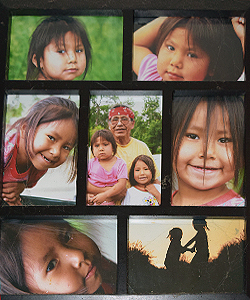 Ben passed on his grandfather's teachings of treaties and the Lakota values to his daughters. Ben tells his daughters, "Take whatever is offered and don't turn anyone away if they don't have enough." Ben was glad to see a lot of people supporting protection of the environment and local water sources and elaborated about the impact of contaminated water, not just for the Lakota, but for all the other thousands of people who relied on shared water sources. From his traditional upbringing to his military service, he saw the value of ensuring language and culture is embedded into the school curriculum. He explained, “There is a positive correlation between better grades and teaching language and culture [to our youth].” On the day of our visit, Ben helped with the morning songs at the school.